Harness the power of the sun and keep your mobile devices charged with the Solartab 13000mAh Battery Pack. 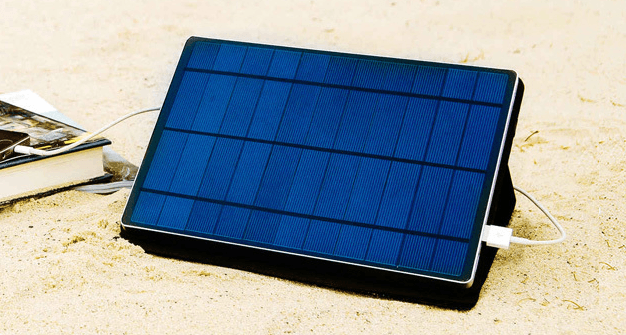 The environmentally friendly Solartab features an efficient 5.5W solar panel that converts the sun’s energy into electricity, which can then be used to charge your USB and micro USB capable devices. This means you can keep your smartphone or tablet powered without adding to your energy bill – and now you can save 21 percent off the MSRP on TNW Deals. As its name suggests, the Solartab is a solar panel with an integrated battery pack that has two USB power output charging ports. The built-in Mono-crystalline solar panel on the Solartab has an output of 5.5 watts, which is enough to completely charge the Solartab’s internal 13,000mAh Lithium-Polymer battery from dead to full in one full day of direct bright sunlight. If it’s a dark rainy day, you can always resort to charging the Solartab via its micro USB input charging port and the included 10 watt USB wall charger. Having the Solartab’s shape and size so closely matching that of an iPad it makes it very convenient to carry in a wide variety different backpacks, purses, and even various jackets that have special pockets specifically designed to carry an iPad sized tablet. The Solartab weighs in at 2.65 pounds and has the following dimensions: 9.7” (W) x 7.6” (D) x 0.35” (H) inches. The perfect charger for home or on the go, with an environmentally friendly bonus, is finally here. Pick up the now on TNW Deals for just $109. Read next: So, what will Twitter's 'long tweets' actually look like?